The Greer library will close for a year while renovations take place at the Pennsylvania Avenue location. 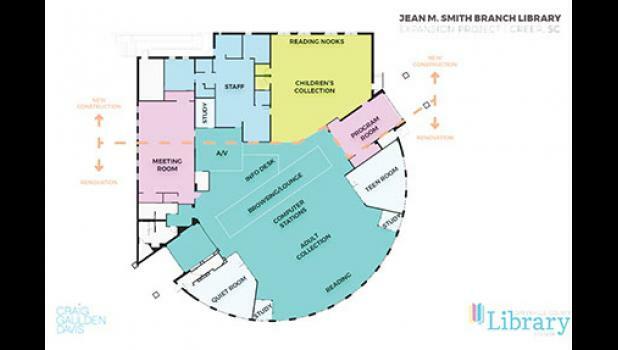 Work is set to start in late August and will add 5,500 in new square footage to the Jean M. Smith Branch of the Greenville County Library System. During the closure, the Bookmobile will be available every other Monday from 1:45 p.m. to 4:30 p.m. in the parking lot of the Greer First Baptist Church at 201 W Poinsett Street beginning Aug. 13. Materials borrowed from the Jean M. Smith Branch in Greer may be returned to the Bookmobile or any Greenville County Library System location. When reopened, the branch will include the following: expanded children’s area double the size of the current space; dedicated space for teens; enlarged community meeting room with seating for up to 120; two new four-person conference rooms; enclosed quiet space for reading and studying; new interior finishes; drive-up materials return; family restroom; nursing room; and additional parking. Starting Monday, July 30, the branch will be closed until the fall of 2019. During the closure, the public is invited to use the Burdette Branch at 316 West Main Street in Taylors or any of the other ten Greenville County Library System locations. The $4,990,000 project budget is funded by the library system’s accumulated capital fund reserves with no bond issue necessary. Engraved pavers will be made available for purchase to raise additional support. Architecture firm is Craig Gaulden Davis of Greenville, and the general contractor is Clayton Construction Company of Spartanburg. Founded in 1921, the Greenville County Library System operates 12 facilities and a Bookmobile. GCLS provides resources, services and programming that champion literacy, inspire learning and foster community connection. The Library System strives to be the community’s first choice for exploration, discovery and information.